Is it just me or are movie posters getting supaflydope lately? I was browsing Animal New York tonight and one of their bloggers briefly profiled these sweet “minimalist” film posters. Recently, my co-blogging edub partner mentioned buying this masterpiece. Now, she’s on the right track (…yes baby, she was born that way). But I want more! I want TV shows to consistently produce high quality posters as the norm. Poster art is serious business to this edubber. How serious? Theme-of-my-bat-mitzvah serious. That’s right. Movie posters adorned the walls of the colorfully decorated Belvedere Recreation Center in the fall of ’92 when I celebrated becoming a daughter of the commandments and my mom caught [Redacted] smoking pot in the boys’ bathroom. I digress. It seems like, thanks to the interweb, film posters are emerging from designers all over with unique, swanky takes on their Silver Screen favs. So I ask, what about us boobtoobers? Where’s the creative force designing 2d-iconography for our favorite sitcoms or serials? It’s revolution time people (too soon?). It’s time for every tv show to create a poster, just as every movie creates a poster. Separate is not equal. Honestly though, can someone please just print a black hole with the Henrickson family falling gracefully, surrounded by stamps of Nikki’s best one-liners? Is that so much to ask? She liked this one. I much preferred hers. When you’re right, you’re right. Do you realize how much good TV comes on Wednesdays? Wednesday is my new Thursday. Booya. A bunch of analog stations switched over to digital yesterday ahead of the new deadline. So far the FCC is reporting very few issues. Sidenote: A kid I work with just submitted his application for a converter box. I asked him “What took you so long?” He said, “I didn’t know anything about it.” If you don’t watch enough TV to hear about the digital transition, I think it’s okay if we transition without you. 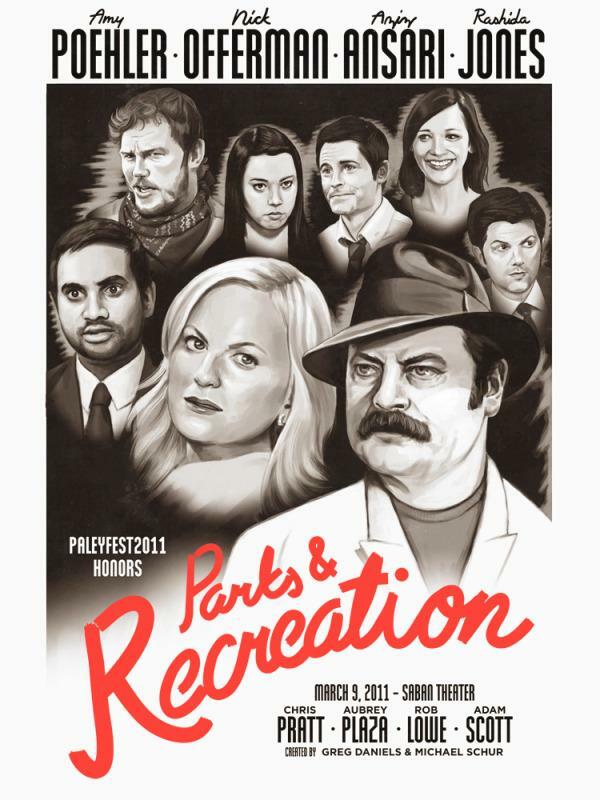 Amy Poehler’s new show, Parks & Recreation, started filming today! Color me geeked! Kristin Dos Santos has an interview with the star herself. Angela Kinsey (Angela from The Office) and her husband Warren Lieberstein have separated. If the name Lieberstein sounds familiar, it’s because Warren is Paul Lieberstein’s (aka Toby Flenderson) brother. I think a recession era economy, novelty shoes should be the first things to go. Check out these Family Guy and Fresh Prince insprired sneakers. The Roots are Jimmy Fallon’s house band and word on the street is they can only perform all new original content. That’s about 200 new songs a season. Better get crackin! Speaking of late night music, U2 is going to perform on Letterman…for a straight week. I’m sorry, but that just doesn’t sound appealing to me. Jorge Garcia from LOST blogged about his salt crystal deoderant. I kind of want to try it. Speaking of LOST, it better watch it’s back. It’s losing viewers every week and it will have to compete with American Idol starting in March. After 19 seasons The Simpsons got brand new opening titles. It’s the same general theme but we get to see a lot more of our town favorites. There’s also a few homages to past episodes in there. Guess which washed up early 90’s rapper is getting a TV show? MC Hammer. I know, I was hoping for Snow too. Someone is going to die on Big Love. Michael Ausiello runs us through the odds. Tracy Morgan’s apartment caught fire due to a busted light in a fish tank. Surprisingly the fish were okay, as were the rest of the folks in his building. And finally, my favorite non TV related link of the week: “Fidelity: Don’t Divorce Us” Take part in the Courage Campaign if you’re so inclined. Big Love is coming back on January 18. You can ask Bill Paxton a question on the Season Pass blog. My question: Does he know how ridiculous he looks on the Twister Experience at Universal Studios Florida? Tori Spelling is *this close* to coming back to 90210. Since the old folks are the only thing making that show interesting, I support this news. Has Friday Night Lights always been on Hulu? I might’ve just missed it. Seasons 1 and 2 are on the site which means you can find me in front of my computer for the next several days. I don’t think I’ll finish in time for the January 16 return but it’s worth a shot. Tim Allen and his wife Jane are expecting their first baby together. I only tell you so I have an excuse to link to the best mugshot ever. To the people thinking about buying the NCIS soundtrack: Don’t! This 2001 clip of Obama on Check, Please!, a local food review show is making its way around the internet. I also like corn cakes Mr. Obama. That’s going to be my opening line when we meet at the inauguration. Kathy Griffin is no longer banned from The View. Hopefully she makes an appearance sometime soon. Anyone else watch her with Anderson Cooper on New Years Eve? A-Maz-Ing! Sanjaya’s album is finally coming out creepers! This cover art will make your brain-box explode. And finally, my favorite non-TV related link of the week: Instructables.com. This handy site will teach you how to do just about anything. Unrelated: This week my mom helped me sew up my very own Slanket (some of you may know it better as the Snuggie). Best invention ever. Make it yourself. It’s cheaper and you get to pick a cooler fabric.